Holy cow! This is a huge freaking driver. This XLS driver is slightly smaller than a tennis racket. If you can't hit the ball with this colossal thing, then you might want to get your eyes checked. 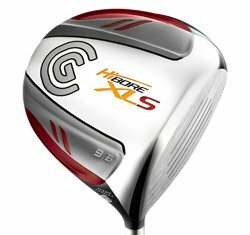 This monster driver is 17% bigger than the HiBore XL and has a 13% increase in MOI. This is one of the biggest on the market. It has all the weight low and deep in the clubhead and an "Energy Transfer Core," which is thin titanium spines that direct the energy to the golf ball for a higher ball speed. I must say, I did enjoy hitting this club on the driving range. Although, the huge head made me swing way too hard. (I guess this is not a good reason to dislike it. It's like saying you don't want a Ferrari because you'll drive too fast.) For the most part, even when I put a really bad swing on it, the ball flew far and straight, but I never did get used to the loud "tink" sound it made. I would recommend this club for you guys who like to get both feet off the ground when you swing your driver. Grab this bad boy and grip it and rip it. However, if you are a feel player who likes to work the ball, you'll want to pass on this big boy. If you are looking for a power driver that has a little more feel, check out the PowerBilt Air Force One Players version. It's a distance driver with a tour-type club head. If you like the huge club heads, the HiBore XLS is one of the biggest. In fact, heat up the face and you could probably iron your golf shirt with it.